A few weeks ago, my family challenged me to become a vegan for a week. For an enthusiastic omnivore, a week of what I viewed as deprivation was indeed challenging. As the days passed, I moved from curiosity to resentment to anger and then finally, acceptance. Two unexpected epiphanies came out of this experience. The first was that veganism can feel single-dimensional, like listening to an a cappella group instead of a symphony orchestra. Without meat, or at least dairy products, vegan diets feel thin, their ingredients lacking the tonal capacity to play off of one another, relying on solo performances for a discriminating audience. The second surprise was that with a little imagination, life without animal products is tenable and can consist of flavorful, tasty meals. Maybe even healthier. With this week behind me, I explored a local vegan bakery, The Happy Vegan Baker. Veganism appeared first in Britain as an offshoot of The Vegetarian Society founded in 1847. Some Britons found the non-carnivorous life still too promiscuous. Almost fifty years later, British social reformers, motivated by both evangelicalism and the Quakers, demanded more protection for children who were factory workers and animals. In the 1890s, Henry Salt founded The Humanitarian League to improve the welfare of humans and non-humans. Almost a hundred years later, a more radical group emerged (1944) that rejected the idea of eating any animal products at all, including those that did not require killing an animal, like butter and cheese. In some ways, the rise of veganism after WWI parallels the recent lurch to localism, the intention to eat locally grown food. Both movements, if considered a form of dietary activism, entail rejecting one practice for another and the drawing of boundaries between one “purer” morality than another. These vegetarians and vegans were hardly the bohemian left of society. Many were conservatives, whose bold rejection of British meat-eating identity signaled a modern sensitivity and rejection of animal cruelty. Some vegetarians in the early 20thcentury saw the consumption of dairy and eggs as only a temporary expedient on the way to total rejection of animal products. It is no wonder that these were the first to form the first vegan group in Britain in the 1940s. People draw these boundaries for both ethical and health reasons and emerge during good economic times when people have more disposable time and money to consider choices previously unavailable. Combined with a fashionable interest in Eastern philosophies, new economic freedom led to more discretionary diets, and more boundaries between eating communities. A recent article by Jessica Greenebaum in Food, Culture & Society argues that vegans engage in a process that is constantly negotiated and situational as they seek to become more authentic within their community. Vegans are thriving in Austin’s community. Most restaurants and food trucks offer vegetarian options and more and more include a vegan dish. A website called VeganAustin.org is the home of a group called Vegans Rock Austin. The group bestows the rating of “Vegan Best of Austin” to local restaurants while it sponsors an annual event, the Texas VegFest where you can meditate, participate in a bodybuilding event, or watch cooks demonstrate how to make tasty vegan dishes. A combination of health and spiritual wellness infuse the vegan groups in Austin and one such enlightened vegan is Inge Jorgenson. This is no happier vegan cook than Inge at the Happy Vegan Baker. The beaming baker is a graduate of Cordon Bleu and a lifelong vegan. She came to Austin from Cape Town, South Africa in 2009, began to work at Hudson’s On the Bend, the University of Texas at Austin and Lakeway Spa Resort until her baking business began to take off. Now, she combines her bakery business with her work as a dietitian at Seton Family of Hospitals, a fitting occupation for someone who is finicky about food. Inge was always careful about what she ate, according to her parents, Charlotte and Andre. While not proselytizing veganism, Inge feels that vegan diets are generally more healthy than other diets. Her parents recently joined her in Austin to work together in the bakery. 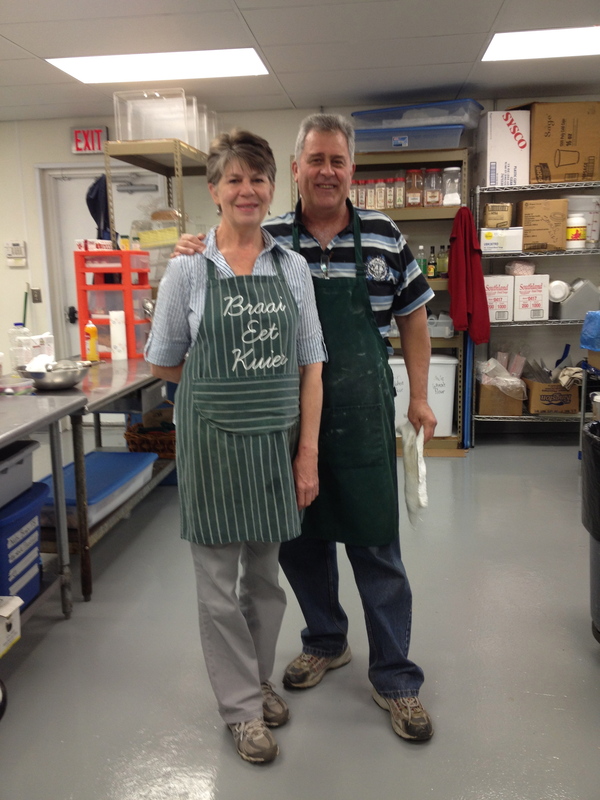 Charlotte, a former special education teacher, and Andre, who formerly worked in the armaments and cellular telephone industries, both bring a home-cooked feel to the bakery menu and management skills for the business side of the business. Now there are three smiling vegans in the kitchen, an auspicious combination for a company that is expanding its business and growing its capabilities. And far from separating vegans from omnivores, Inge is doing her best to embrace all food lovers by baking pastries and concocting new recipes that appeal to the palates of anyone who appreciates tasteful, fresh, and imaginative food. The Happy Vegan Baker is a family affair and their affection for each other is evident. Their kitchen, or commissary, as Inge calls it, is hidden behind other small confectionary enterprises in a unremarkable office park, absent a sign or directions to the bustling bakery. But inside its brightly lit space, mixers are humming and smells of pureed fruit fillings and dark chocolate cake batter fill the atmosphere. The bakery produces small fruit-filled tartlets, cakes, pies, cupcakes and is now venturing into more savory affairs, like breakfast tacos. Surprising to some of us non-vegans, is that these confections taste good. While missing the usual eggs and butter omnipresent in traditional pastry, Inge’s creations use vegetable shortening and innovative combinations of ingredients to produce tastes and textures that are satisfying and perfectly acceptable, even to us non-vegans. Billowy clouds of icing hover atop dainty cupcakes that fill Inge’s stall at the local farmer’s markets. Her business began in 2007 when she first got her space at one of Austin’s farmers markets. From there, she and now her family have expanded to other markets. One day they hope to open their own small café with a warm, home-like feeling, an aspiration that seems well within reach of Inge and her this dedicated family. A long cry from the seriousness of the original vegan movement in Britain, Inge’s happy countenance is reason enough to partake of her pastries. And her apple tarts, which I recently enjoyed, contributed to the revised view I now hold about vegan diets. Political and social implications aside, veganism plays an important part in our culinary landscape and offers choices and opportunities for innovation. Inge is one of those innovators who seems to be re-inventing vegan cuisine in ways that are appealing to even the avid omnivore. This entry was posted in Food Warrior Interns, In the Pantry (food artisans) and tagged austin, Real Time Farms, robyn metcalfe, the happy vegan, vegan, vegan baked goods. Bookmark the permalink.